Poetry In Motion Kare Bears, LLC. 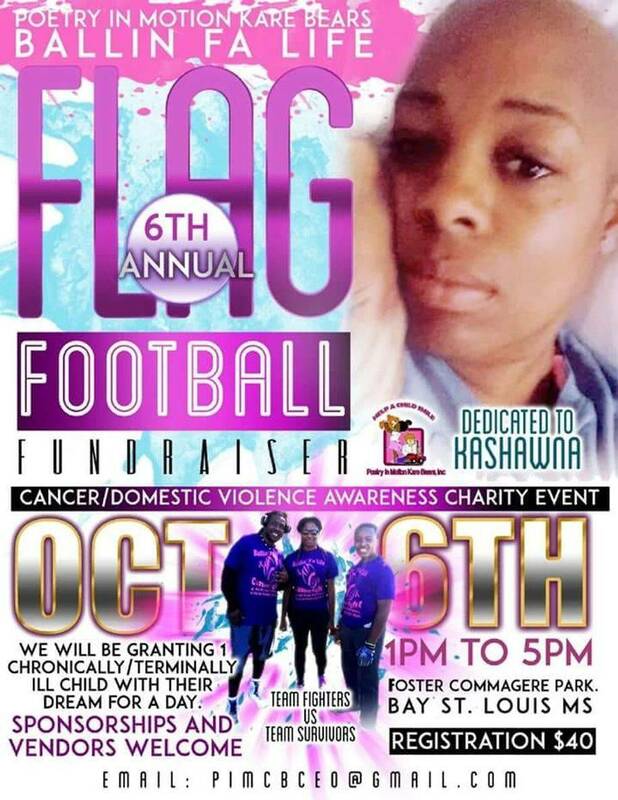 We are gearing up for our 5th Annual #BallinFaLife Co-Ed Flag Football Cancer/Domestic Violence Awareness Fight October 14th in Bay St. Louis, Ms Donations and proceeds for this event will go to children battlign cancer in hospitals and those in Safe houses due to domestic Violence. Lookinf forward to seeing you there. Remember all donations are tax deductable. Your hearts are appreciated. Registration is now opened. Our 1st Annual CHD Basketball Fight was a great success, and now on to our 5th Annual Cancer/Domestic Violence Co-Ed Flag Football Game. See you there. We are happy to announce that Lil JJ (Super Saints Fan) will be participating in our 1st annual CHD Basketball game. He will be playing on Team Heart going head to head with his Dad who will be playing on Team Soul. Be sure to get your tickets and be there for a great cause and to meet lil JJ. We are thankful to all our sponsors. iHeart Radio, Walt Disney World, BLI Photography Studios, Till Mac's Corner, Poetic Situations Design, and Silk Sations bath, body, and natural hair care line. CHD General Admission Ticket link. Where all my balla's at? August 19, 2017 PIMKB will be Ballin fa Life once again. This time we are doing it for CHD awareness. Advance tickets are $10 and $13 at the door. Children 5 and under get in free. Proceeds from the game will benefite the organization as well as give 1 or 2 children battling CHD their Dream for a Day. Be sure to come out to have some fun and support a great cause. VIP tickets($35) are available for purchase. Tables in the vip section are avaible for purchase also. All vip tickets comes with a vip badge that will be shipped to your mailing address. contact us to purchase. Sponsors are appreciate. We have sponsorship packets available upon request. Our Annual Ballin Fa Life Cancer Fight Co-Ed Flag Football event was a huge success. It was truly the best one yet. We got to honor 5 cancer fighters and survivors. #TeamFighters are once again the champions aganist #TeamSurvovrs.. but it was all for a great cause, and we all had a good time. I am very honored that the event was sponsored by all small businesses this year. I am looking forward to 2017, we have a lot in store for you guys. We thank you all for your continued support for the past five years, we have many more to come. Be sure to check out the photo gallery. For the last two years we have had several set backs and have not been able to do as many visits and events as we had orginally planned. Our CEO fell very ill within those two years and twice almost lost her life, just recently in 2016. But despite the set backs, she is more determined than ever to help so many more children smile through their pain while honoring cancer fighters and survivors along with domestic survivros. She has our schedule planned out for 2016 and are setting things in motion. She says it is more important than ever to her now because tomorrow is not promised, and while she still can, Tasha is determined to do as much as she can for as many as possible. Please keep our CEO in your prayers as she is battling some chronic and life threathing illnesses, but that heart of hers is bigger than ever. We appreciate each and everyone of you who continues to support our efforts to "Help a Child Smile"
1st Visit of the Year. Our Hospital visit of the year has been changed from March to April 10, 2015. We have the pleasure of having Thais founder of Bibby Gumbo Book Club and Herberna Co-Owner/Co-Host of Music Talks Radio volunteer their time for our visit to Ochsner Pediatric Hospital on Jefferson in New Orleans. I am very excited to be able to do our hospital visits once again. This has been a long recovery process but I am getting stronger everyday. I am so looking forward to being more smiles to as many little faces as possible. Thank you all for your continued support. 2013 has been a very stressful yet very blessed year. With our CEO almost loosing her life due to a sever illness that left her hospitalized for a minuet leaving all of our planned events for the year on hold. We are very happy to say that she is recovering and is ready to get back to helping some dreams come true and putting smiles on many little face with our regular hospital visits and our Dream for a Day poetry event. Our 1st Hospital visit of the year is scheduled for March 2015. We are so looking forward to this visit as we will have a special guest that will be reading to the children. We are also in the process of planning our 1st Dream for a Day event. We will be sure to keep you all posted every step of the way. Thank you all so much for your continued support. We greatly appreciate each and everyone of you.